Field Notes are back in the game with their latest colors edition! The Unexposed colors release are brilliant and I am a big fan! There has been a lot of chatter on this release and after getting these in the flesh I can see why. The lack of information on all aspects of this edition ruffled some feathers with Field Notes fans and was a hot topic in the Field Nuts Facebook group following the announcement. Everything about this edition changes the potential value and collective nature of the Unexposed Field Notes. Keeping any of these packs sealed and ensuring you have one of each colour is pretty hard to predict. However these are after all notebooks that should be used. Perhaps this was the feeling over at Field Notes HQ too. 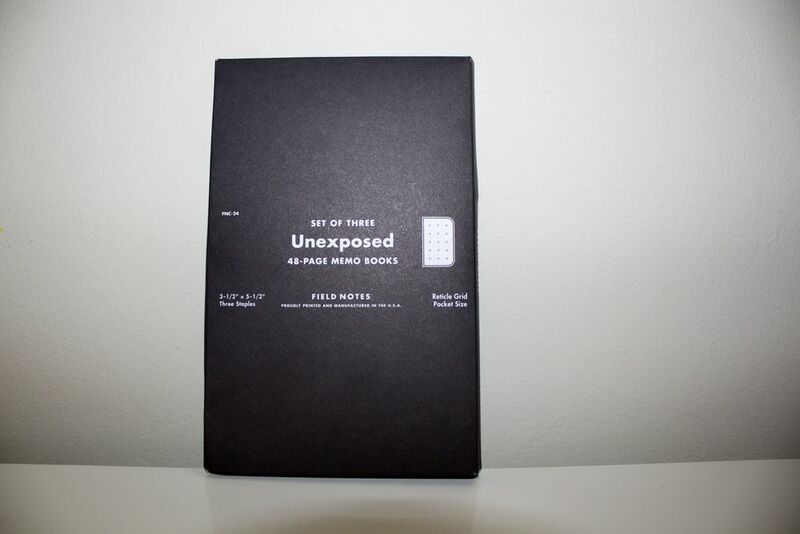 The Unexposed edition was a stroke of a marketing genius. Whenever an announcement of a new edition comes out people go crazy discussing all the specs, but this edition changed the usual ritual. Having a seasonal release that didn't show you what you were going to get, until you got it was a brilliant move. There were some negative comments on the style of the launch which seems to be common with each Field Notes colors release - you can't please everyone after all. For me this is just another way that Field Notes stays original and imaginative in what they are doing. Field Notes produces a video for each of the colors edition releases and the Unexposed video was very clever and a personal favourite. It features a cameo from Aaron Draplin as an anonymous Field Notes enthusiast. If you have time take a look, it's very short but another marketing tool that was used to great effect for this release. The notebooks arrive in a black boxed package giving nothing away - which is to be expected. The inside cover of the packaging has small FN and notebook icon design again showing the high level of thought that goes into each of these seasonal releases. It is things like this that I have not noticed on other pocket notebook brands. With every turn of the page, or opening of a package there is a small feature that is nice to see and makes the whole experience that little bit more exciting. Being here in the UK my notebooks have only just arrived and due to the time frame I was fully aware of what I may be getting. The only surprise element for me by this time was what colours I would get. I was pretty lucky with my packs as I only missed out on the yellow notebook. The pink and purple versions of these notebooks look very similar to XOXO Special Edition notebooks that Field Notes have produced in the past. We also have a purple Field Notes seasonal release which is a colour Aaron Draplin has often expressed an extreme dislike for (see point 23 in this link). It's a small win for purple fans like myself. The colour options in this edition are brilliant. I have been trying to figure out which is my favourite but I just can't pick. The covers have a very similar feel to that of the Drink Local edition from Autumn 2013. The soft-touch cover provides the notebooks with a bit of texture and gives it a matte coated look. The Drink Local edition was a personal favourite and it has been the only edition where I have continuously used one of the 6-pack notebooks. It's nice to see the same style of covers being used again. The covers of the Unexposed edition feel a bit thinner than the Drink Local but it is a minimal difference that you may not notice. I think they will wear quite a bit with use, which I am looking forward to seeing. The inside covers of the Unexposed edition notebooks are the inverted colour of what you see on the outside. Some of these are pretty crazy and trying to read what is on the inside covers can make your eyes water, but it's a great way to continue the crazy psychedelic colours. The grid system used in this edition are the same that has been used in the Night Sky edition, the reticle grid (good luck trying to say that word correctly). Again this has divided opinions. I quite like grid, it makes a nice change. If you haven't used this grid before then it can take some getting used to but after a while I have found it less cluttered than it initially appears to be. ...I love this edition. It is up there with some of my favourites. Colours are great and the notebook design is simple. I am interested to see how this edition wears with use. I will do a short follow up post on how they wear in the coming weeks.